Kids cut out pictures to put these silly, mixed-up animals back together. After your child puts the animals together, have him name and describe each animal, and compare and contrast their appearances. Kids completing this worksheet exercise thinking and fine motor skills and observe similarities and differences in the appearance of animals. 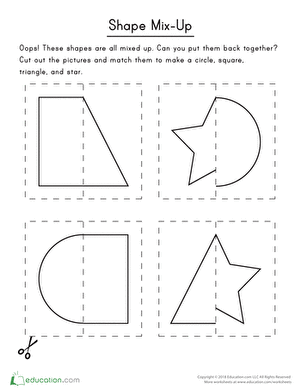 Kids cut out pictures to put silly, mixed-up shapes back together on this prekindergarten math worksheet. Use sorting and categorizing skills to match the baby animal to its adult form. Set your junior sleuth on the case and have her put these mixed-up matching sets back together again. 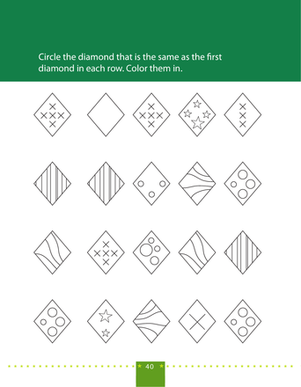 Match up some brightly colored sailboats on this fun preschool matching worksheet. 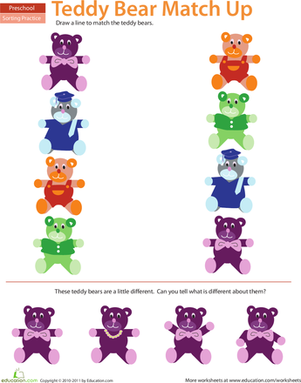 Try a matching activity: in this worksheet, kids draw a line to connect matching teddy bears. 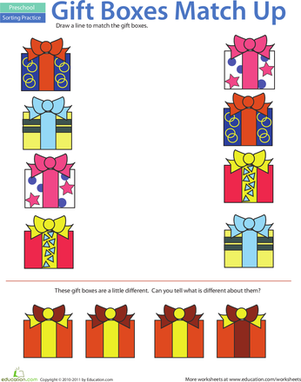 See if your preschooler can do this library matching game without making a peep. Have him identify the matching library objects and draw a line connecting them. 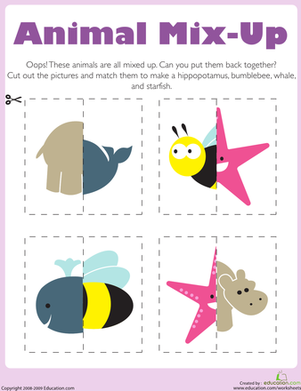 Can your child help match up the right tail to each animal? That's not a good meal, but this is a great matching worksheet for a preschooler. She'll put her powers of observation to the test as she pairs up matching gifts. They use their observation skills to study details and find matching diamonds.